it's by time i got summery up in hither. 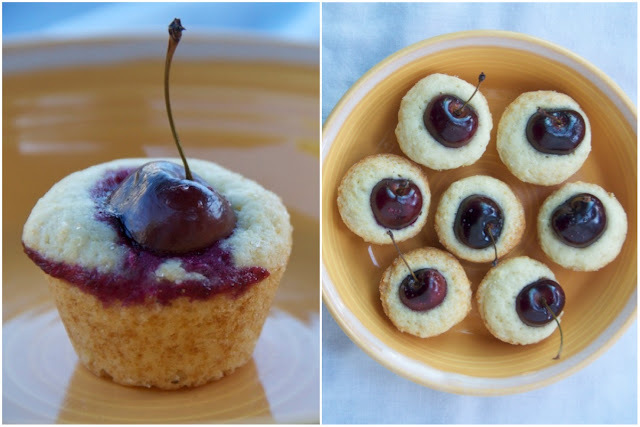 how into cherries are you right now? i keep eating them and not stopping until i've put my stomach in a funk. cherries are cuties. i wanted to bake something that would show off their cuteness. 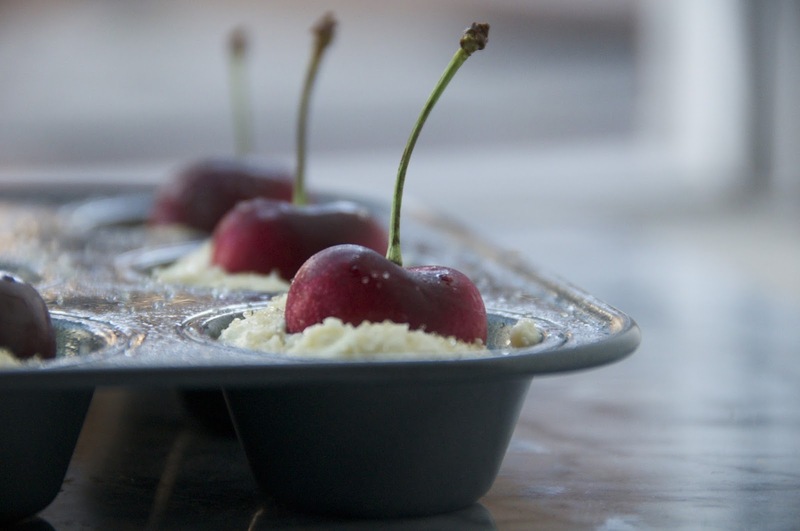 try to buy the prettiest glossy cherries you can find. look for ones with green stems, those are the ones that were picked the most recently. and! keep the pits in there. the pits of stone fruits have little almond flavored kernels inside. when baked, the almond aroma and flavor releases into the fruit. HENCE why almond goes so well with cherries and plums and peaches. nature is so smart. notes: this is a super quick and straightforward recipe. the original recipe was written as little apricot cakes, feel free to plunge whatever summer fruits you have into the batter. it'll be delicious and dainty no matter what. preheat oven to 350. coat mini muffin tins with nonstick spray. using an electric mixer, beat the butter and sugar until light and fluffy. add the egg, zest, and extracts and beat until combined. with the mixer on low, add the dry ingredients in 3 additions alternating with the milk in 2 additions, ending with the dry. 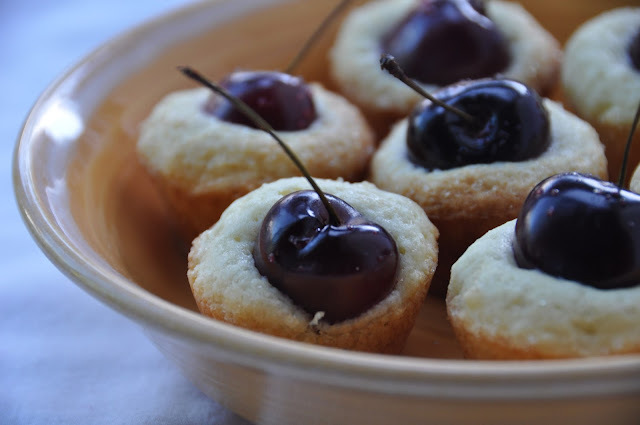 divide batter in muffin tins, i used a tablespoon scoop and filled them with scant tbsps. 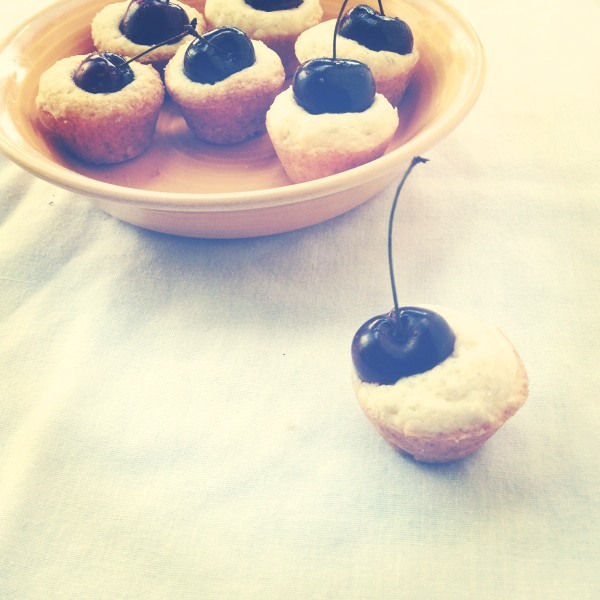 then dropped a cherry in each one and sprinkled with raw sugar. bake until cakes are golden, about 15 minutes.